Good for 66 gallons. 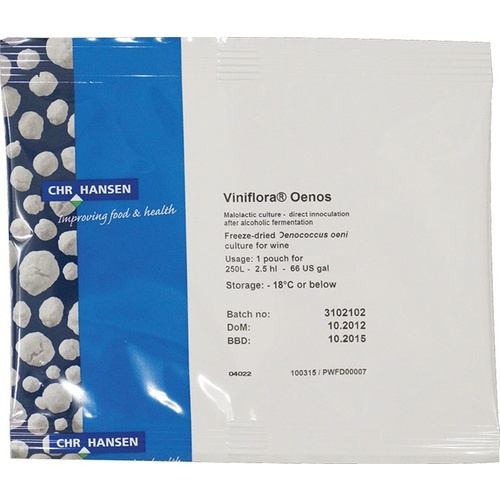 Oenococcus Oeni strain manufactured by Christian Hansen laboratories. Malolactic cultures are bacteria that convert harsher malic acid to lactic acid. They are often used in red wines to mellow them and sometimes in Chardonnay and Sauvignon Blanc to provide the buttery notes. This culture is added 2-3 days into the initial ferment while the alcohol levels are lower. This was the original ML strain that most winemakers used. Alcohol tolerance 14% v/v. There are superior strains now available such as the other five strains that we offer. Recommended by a fellow winemaker. Works on cold hardy reds. To ensure that malolactice fermentation commences. Hate to be critical of a product I've relied on for malolactic fermentation for upwards of 20 years. But this year it hasn't seemed to have worked; even after two attempts. The pH usually rises from around 2.1 to 2.5. But this year it hasn't risen above 2.3. I will be running chromatography test in a day or two. So can't give a usual 5 star rating at this time. Past experiences with this product have been positive. The purchase I recently made is for my 2018 harvest. I've been using this ML strain for several years, it's my standard ML treatment. We have been using this malolactic culture for the last few years, seems to work quickly and completely. Have never had any issues or lack of complete malolactic fermentation. I have used this Malolactic bacteria for years. It always frements quickly and completely. I add it when my must reaches 80 degrees. It likes it warm.